Have you ever been to a place not because you actually wanted to see it, but because you wanted to see someone, and then it turned out to be totally awesome and you never even knew?! This is what happened to me in The Netherlands. I went to The Netherlands for a weekend on my way from Hong Kong to Italy to visit a good friend who I hadn’t seen in 7 years. Yes, I am aware that The Netherlands isn’t actually on the way to Italy coming from Hong Kong. Simply put, some people are worth going out of your way for. In the span of the world, I called being in Italy close to The Netherlands. The world gets both bigger and smaller when you travel. 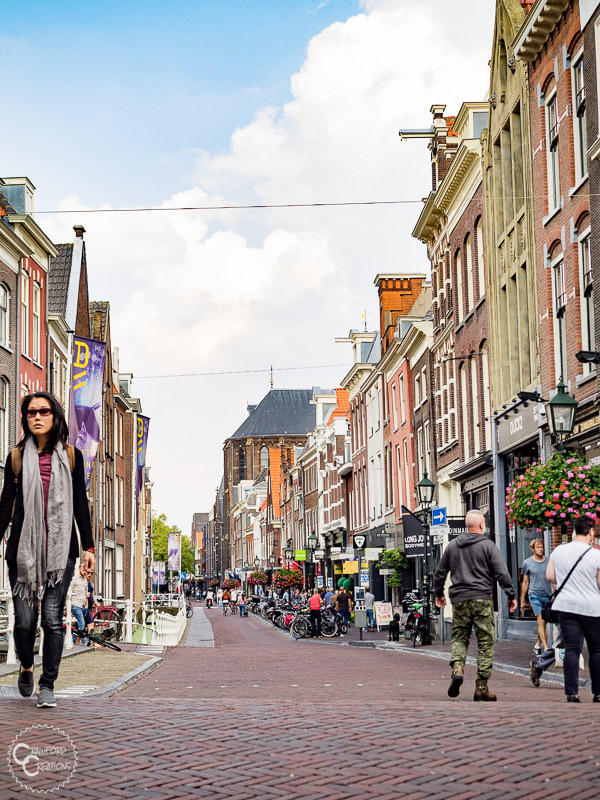 To be honest, I didn’t really know much about Northern Europe in general before I went to The Netherlands, and really never felt any pull to visit the area. Well, the magnets have been turned on now. Although I flew into Amsterdam I never actually saw the city itself. 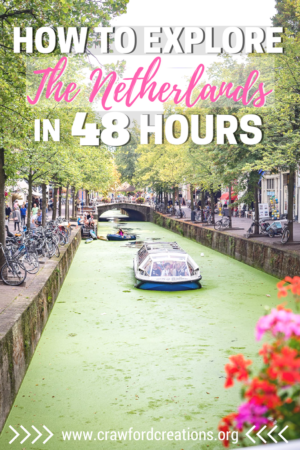 I know, I know, how do you go to The Netherlands without seeing Amsterdam?! 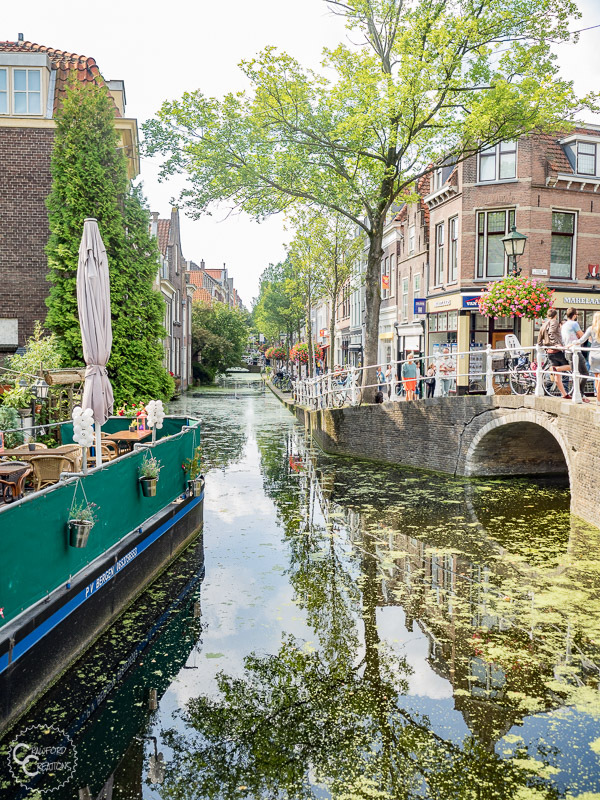 It was like this, I only had two days in The Netherlands and I spent them in The Hague and Delft close to where I was staying. Call me crazy but after traveling for 24 hours halfway across the world, I was all about not spending any more time than I had to on public transport. Next time Amsterdam. Sometimes going somewhere with absolutely no expectations and no plans leads to the best time. 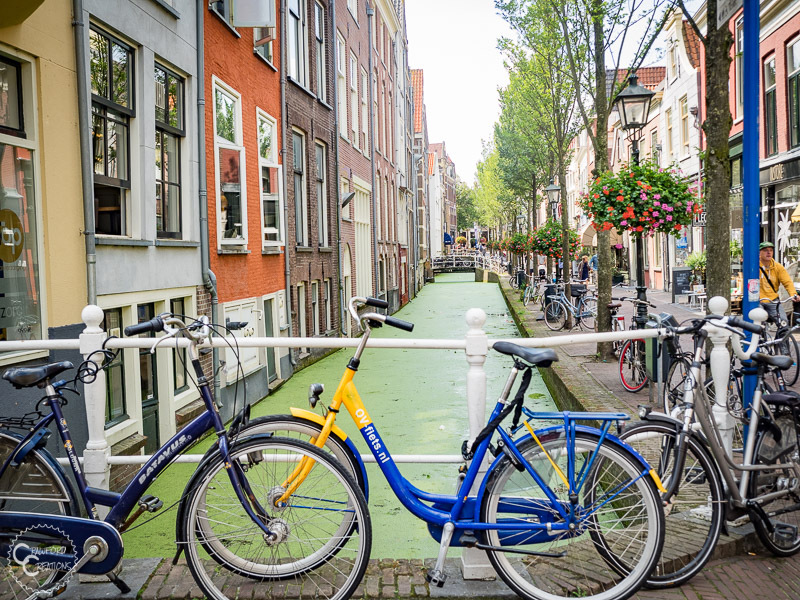 Pretty sure the only thing I knew about the Dutch was that they all ride bicycles. Hey, I ride bicycles too! We were off to a good start The Netherlands and I. To get from the airport to The Hague where I was staying I took a train, conveniently located right in the airport. There are two types of trains that go to all the different cities in The Netherlands, a sprinter and an intercity train. 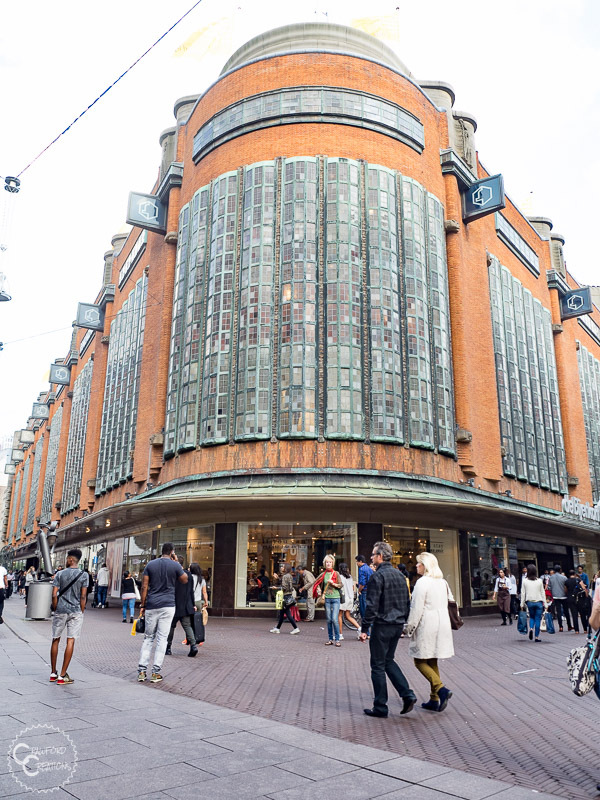 If you’re heading to a major city like Amsterdam, The Hague, Rotterdam, etc. you’ll want to make sure you get on an intercity train. These are like express trains, whereas the sprinters make tons of stops. The terms are not super self-explanatory because I definitely would have thought a sprinter was the express train if my friend hadn’t warned me. My time in the Netherlands started out as all good travel days do, at Starbucks, where I very quickly found out the Dutch are NOT a cash-based society. My 50 Euro notes that the ATM gave me were straight up not received when I went to pay for my coffee. Luckily, all major credit cards work here. It was a strange feeling paying for something with a card. Been awhile since I’d done that. Next, it was off to meet my friends where our first stop was the grocery store. I actually love hitting up the grocery store in new countries. I think it’s really fun to see what the locals eat and what is and isn’t available in the local shops. My best find there, Speculoos! If you don’t know what that is, I don’t think we can be friends anymore…Just kidding! But for reals, you have to try this magic. Speculoos is a Belgian cookie that tastes like spiced caramelized sugar. It’s kind of like a crispy pumpkin spice cookie, without the pumpkin component. Think all the fall flavors wrapped up into one cookie. Ugh, so delicious, and so hard to find anywhere outside of a select few European countries. An unfortunate discovery considering I did not buy a package at the store. I thought, “All the EU countries are kind of like states right? So I’m sure I’ll be able to get Speculoos in Italy and avoid having to carry around a package in my luggage.” I was literally so sure, and so incredibly wrong. You can not get Speculoos in Italy. I wanted to cry. 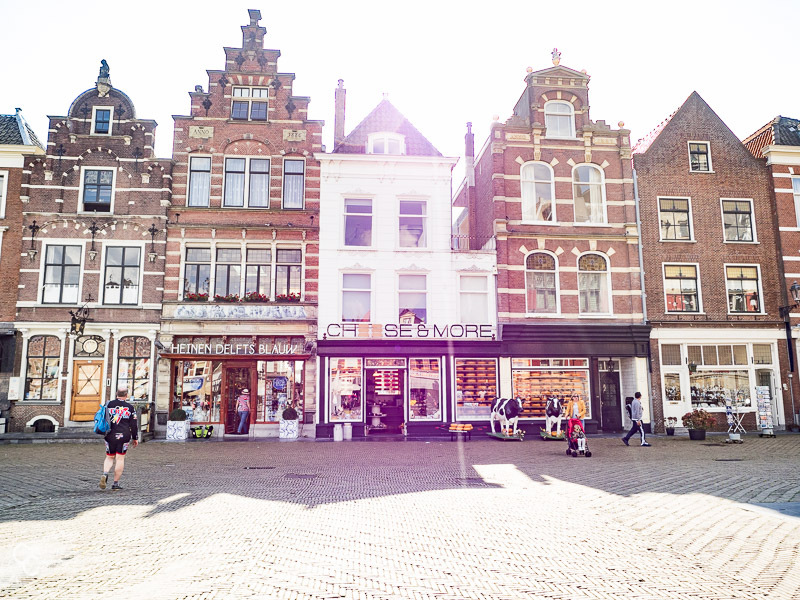 After exploring the grocery store and making the pivotal mistake of not buying Speculoos, we headed back to drop my luggage off at the apartment before being super Dutch, grabbing the bikes, and heading out for a bike tour around town. I was super lucky with the weather over my weekend in The Netherlands. The entire trip was adorned with sunshine and blue sky. Perfect for bike riding and sightseeing. Apparently, the Dutch are big on street fairs because it seemed like every street we rode down was closed off for some sort of festival, and everyone was out enjoying the weekend. I’ve never seen anything like that. They don’t do street festivals in Asia. We parked the bikes a bunch so we could walk around and enjoy the festivities. I was fascinated! There was street food, all different types of artisans, and performances all day long. What is this feeling of community?! I learned quickly that you always have to lock your bikes in The Netherlands. Apparently bike theft is pretty common. Seems weird in a country where literally everyone rides a bike as their primary form of transportation. But I trust my friends. 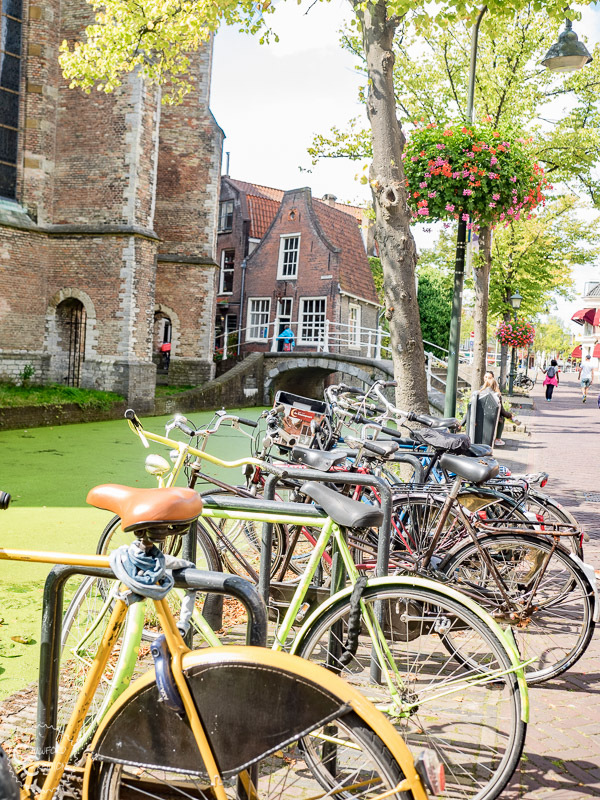 So if you rent or bring a bike to The Netherlands, make sure you lock it when you’re not riding. Oh, also, the Dutch take their bike rules really seriously, which was a major culture shock for me coming from China. You can only ride in the bike lanes and must obey all the traffic laws. I was not very good at this. The Dutch bike riding was a little too uptight for me. Why can’t I just go where I want to go?… Man, I’m so Chinese. Here’s where things start to get really Dutch. On the way back from dinner I got to try my hand at riding side-saddle on the back of a bicycle, a very common thing here in The Netherlands. I probably wasn’t doing it right, but I wouldn’t recommend it for longer than like 10 minutes. There’s no padding on the bike rack and it gets very uncomfortable very quickly. On day two we headed off on the tram to Delft, which I was told is like a mini Amsterdam. I’ll have to take their word for it since I’ve never been to Amsterdam, but from the pictures I’ve seen of Amsterdam, I’d say their description was pretty accurate. The way the tram works is that you have to either have a special card to pay with the machine or literally walk up to the driver when you get on and ask for a ticket. And you must do this, otherwise, bad things happen…idk what they are but I obliged. The Dutch seem to be very law abiding citizens. Again, completely new to me coming from the chaos that is most of Asia. 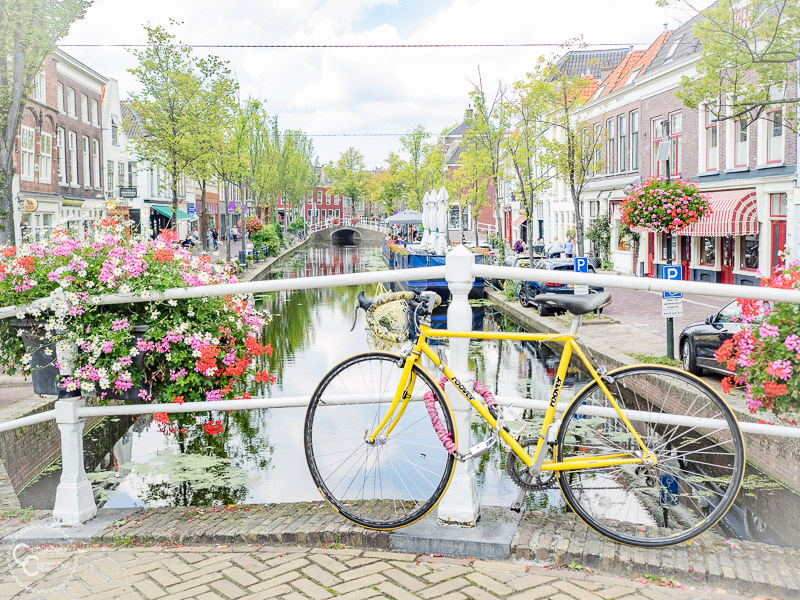 Delft is full of canals, cute bridges, amazing architecture and lots of bicycles, especially the ones locked to the canal bridges. Those are the cutest. 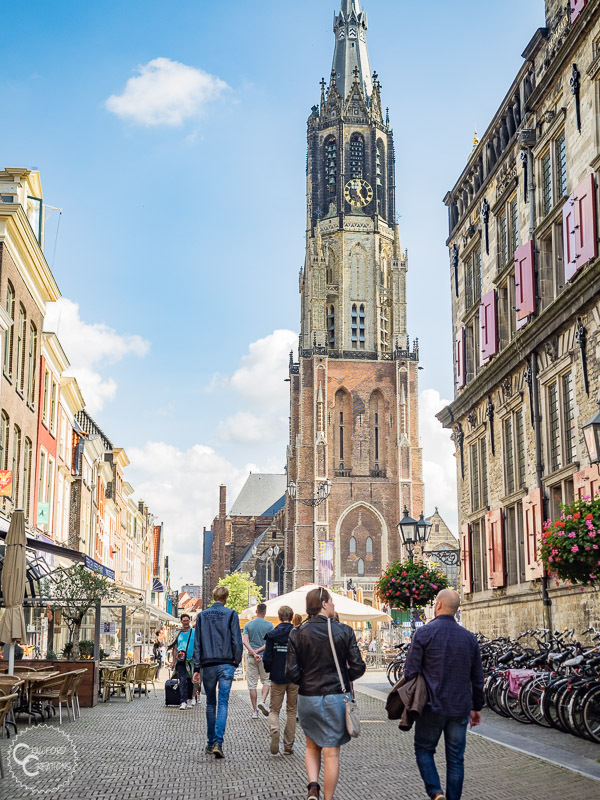 It’s also home to the famous Delft Blue pottery. We spent our day on foot, walking back and forth down some of the most adorable streets I’ve ever seen. The town square was the coolest. It had a super pretty church on one side and another fancy building opposite it, but the best part was the line of connected buildings with the pointy roofs. One of the places there was a cheese shop. I am in love with the cheese shop, a little bit because I’ve never been in an entire store just dedicated to cheese before, and mostly because I just came from the land of cheese deprivation that is China. 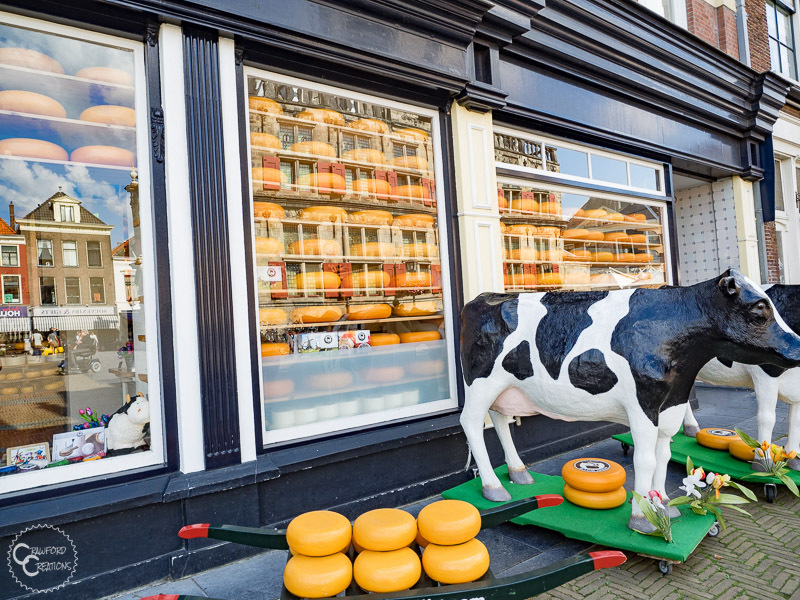 The Delft cheese shop is the cutest, and the best shop there ever was. Oh, and the free samples. There are free samples of every single kind of cheese in the entire shop! So yummy. 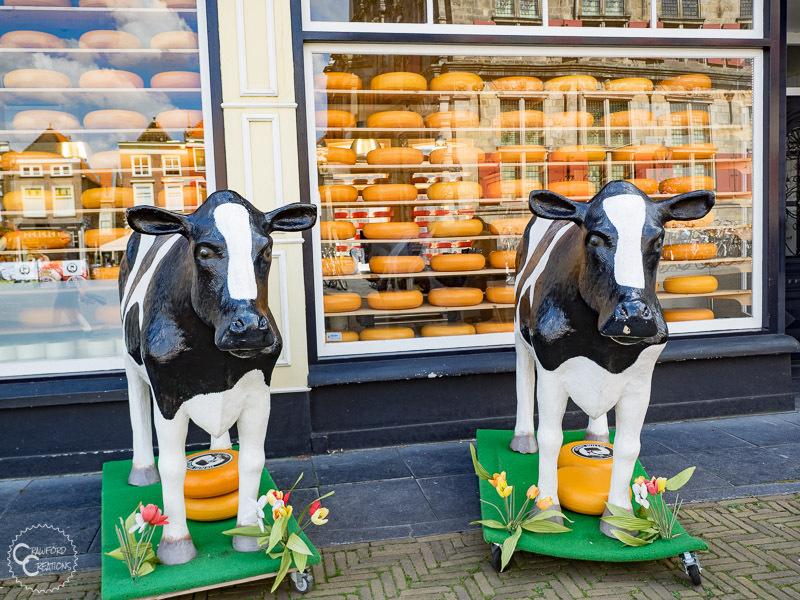 The Dutch are into all these different flavored cheese, like garlic cheese, chili pepper cheese, cumin cheese, etc. They’re delicious. I tried them all. It was great. We also got my first European gelato of the trip in Delft. Man, I missed ice cream. It was amazing, although, spoiler alert, I would go on to have much better in Italy in the coming weeks. 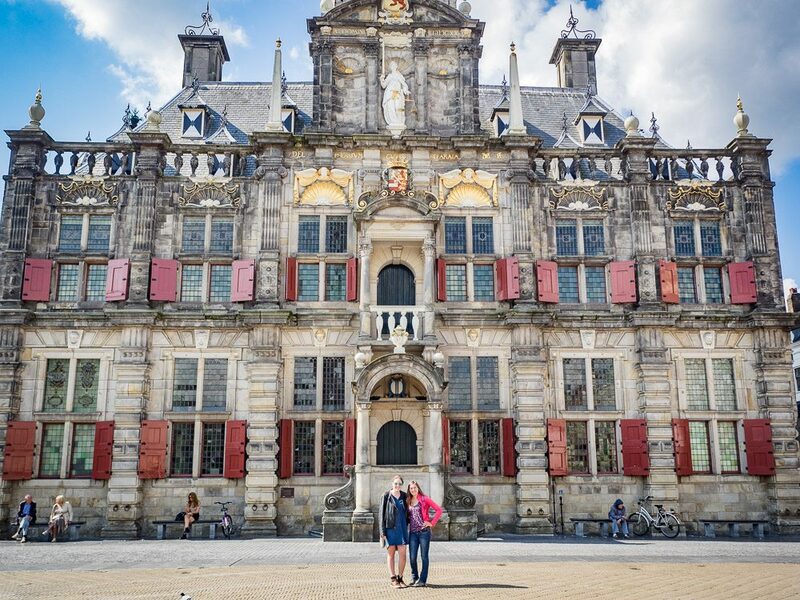 Most of the day was spent wandering around photographing Delft’s beautiful architecture and adorable streets. Oh, and also we went to this restaurant where we ate lunch on a bed and tried a sampler of traditional Dutch food. The Dutch aren’t known for their food. Now I know why. The best things I can recommend are stroopwafel and french fries in a cone with mayo. If you don’t know what stroopwafel is it’s basically two pieces of waffle cone style cookie with a layer of caramel in between. Pretty delicious. We walked off our Dutch food with a sunset walk along the North Shore before tucking in for an early night to prepare for my 3:45 am alarm to head to the airport. I’m not usually about quick trips like this, but The Netherlands definitely surprised me in a really good way. I found it to be a great destination for a weekend stopover, and not just because I have friends there. The country is small, has nice public transport, is clean, safe, and full of English speakers which makes it an easy place to travel without having to do too much research.